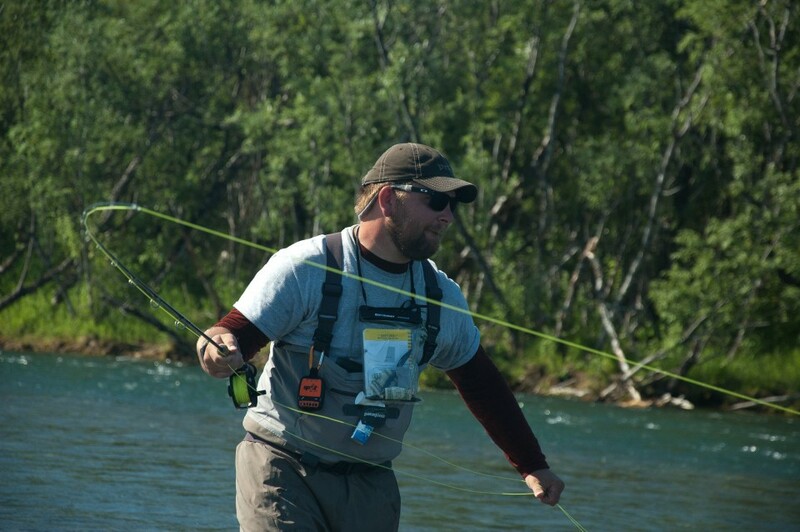 Fly-Fishing on the legendary Kanektok. 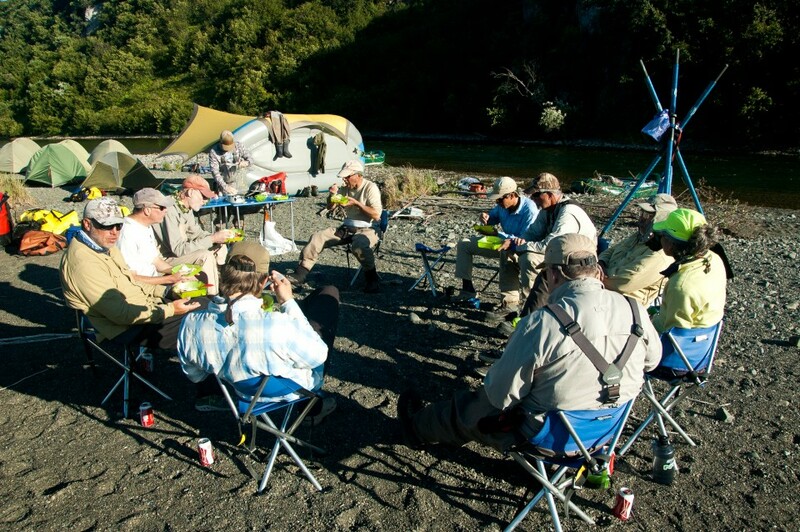 In the last days of July a diverse group of anglers gathered in Dillingham & prepared to fly out and fish the Kanektok. The participants came from Connecticut, from Maryland, Vermont, Alaska, Colorado, and Idaho. 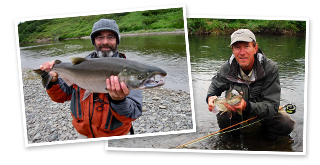 They were saltwater fly casters, Rocky Mountain anglers, dry fly aficionados, entry-level fly fishermen, and an arctic angler! 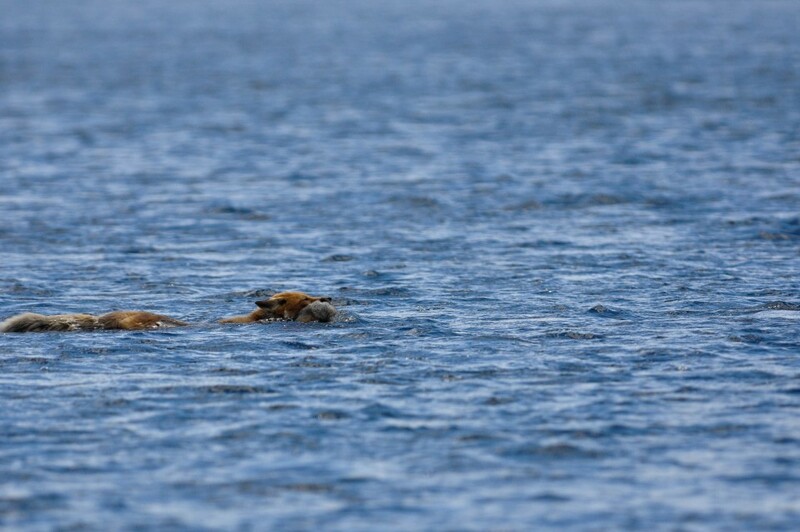 We started off down river and had rafted a mere couple hundred yards when a Red Fox came trotting down to the river. 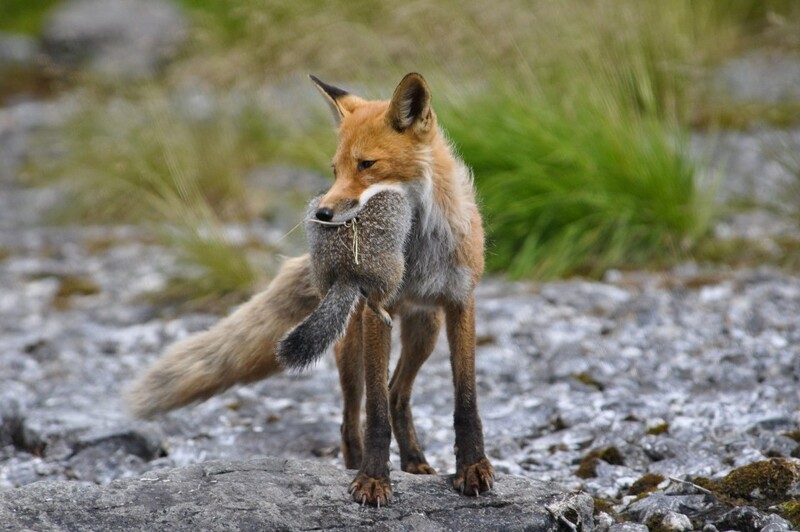 It carried a fresh killed Arctic Ground Squirrel in its mouth and was bound for the den across the river. We fished mainly dry flies as we pushed downriver toward camp and Nora took a superb Rainbow on a mouse while other boats had success on different patterns. 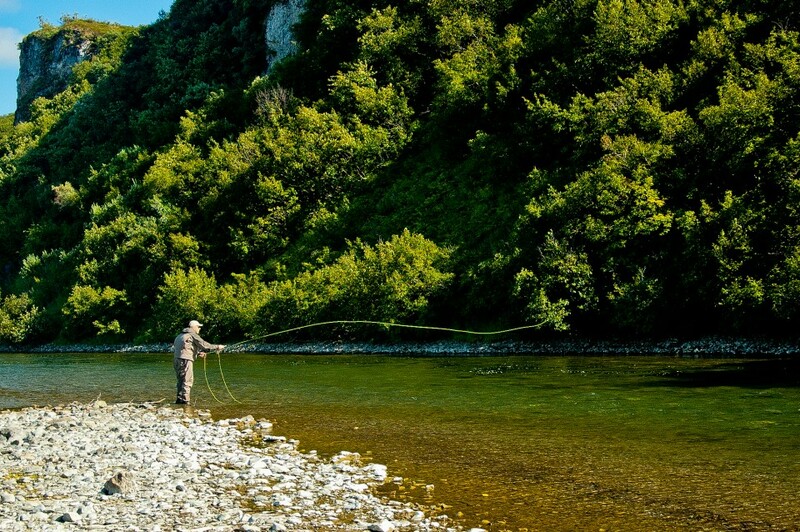 Note we consider the mouse to be a dry fly of course although it’s by no means the only dry we fished. 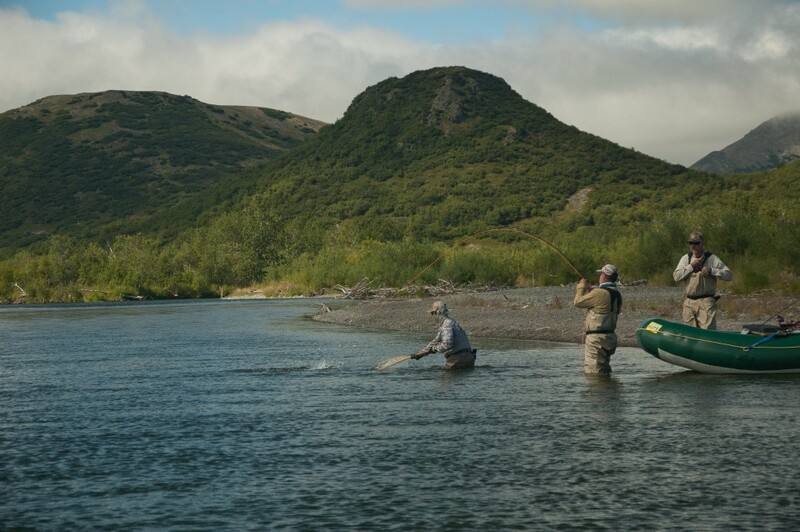 Those who know Alaskan fly fishing will raise their eyebrows when discussing fishing dries because the time and place have to be perfect. Indeed the number of days per year when dries reliably take fish here can generally be counted on one hand; perhaps some year’s on two hands. 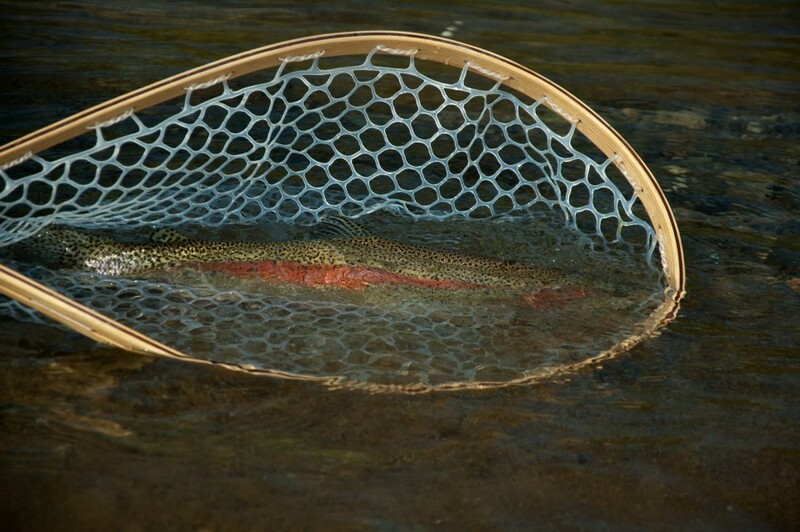 This was one of them where good trout were caught and released in the summer sunlit evening. 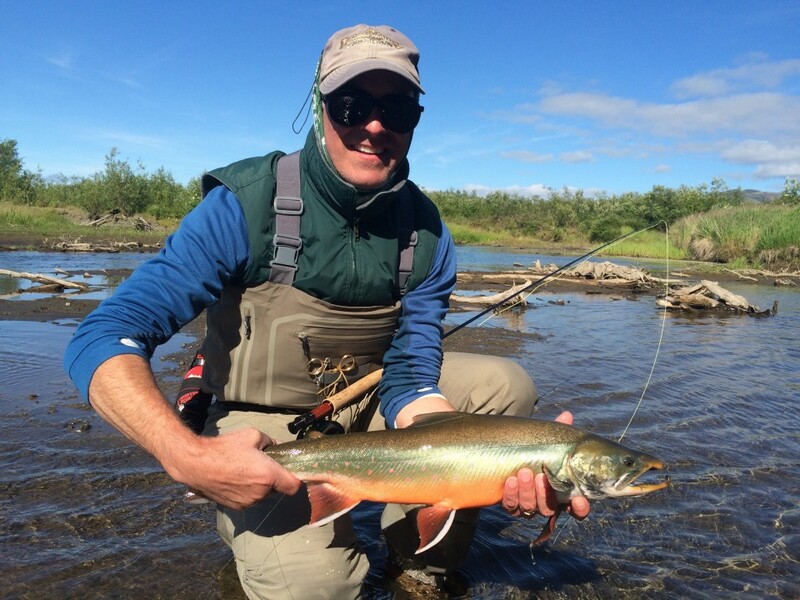 Grayling, Dolly Varden, and a Sockeye rounded out the day’s effort. We awoke on day 2 to a full moon over the river at 6:30 am. The river birdlife got started quite early with Magpies awkward calls and Arctic Terns shrill cries. 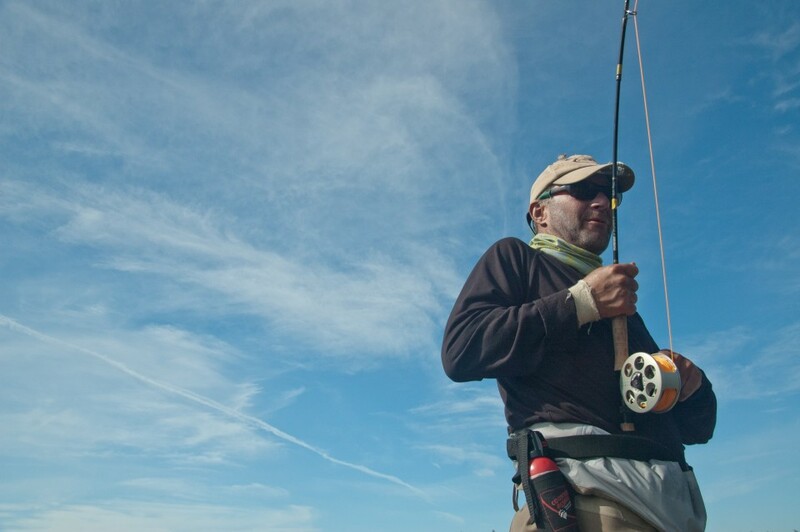 Early anglers had knowing smiles from time on the water while the rest of us gathered ourselves over coffee. 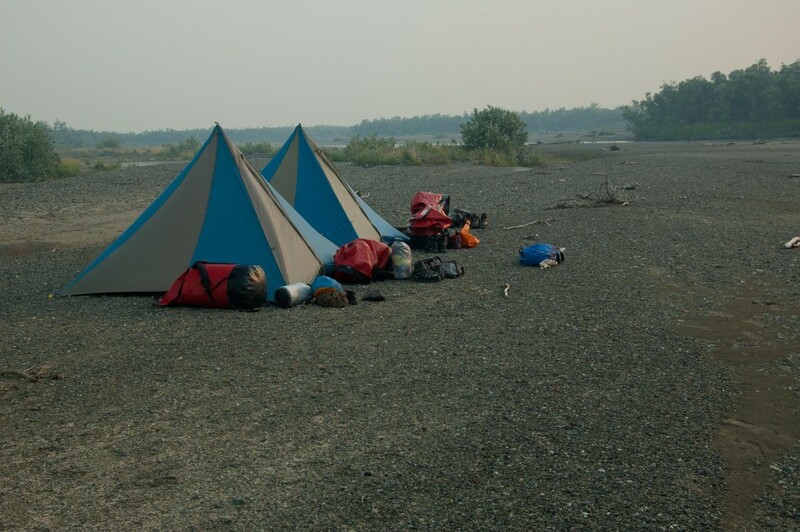 As we prepared to depart camp some combination of air temperature, humidity, and lack of wind conspired to create a hatch of no Seeums, of epic proportions! We were happy to be on the river with however slight a breeze! 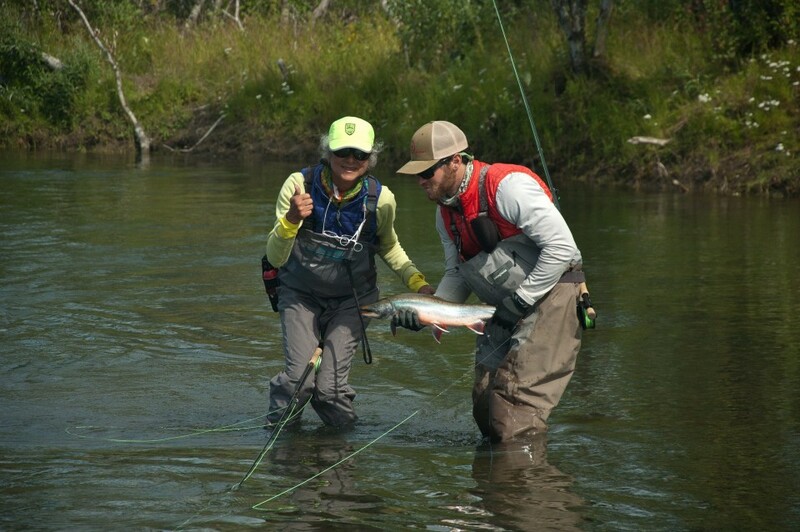 At least two anglers that day, Nora and Alex, took the largest wild Rainbows of their lives. 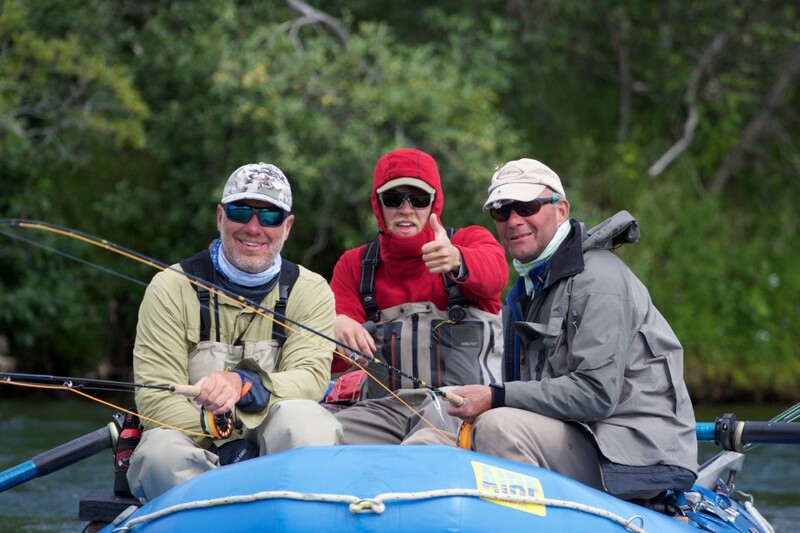 The sounds of laughter, glee, and joyful mirth coming from rafts as we fished were wonderful! The weather cooperated and that made the difference between merely a great day and a spectacular day. 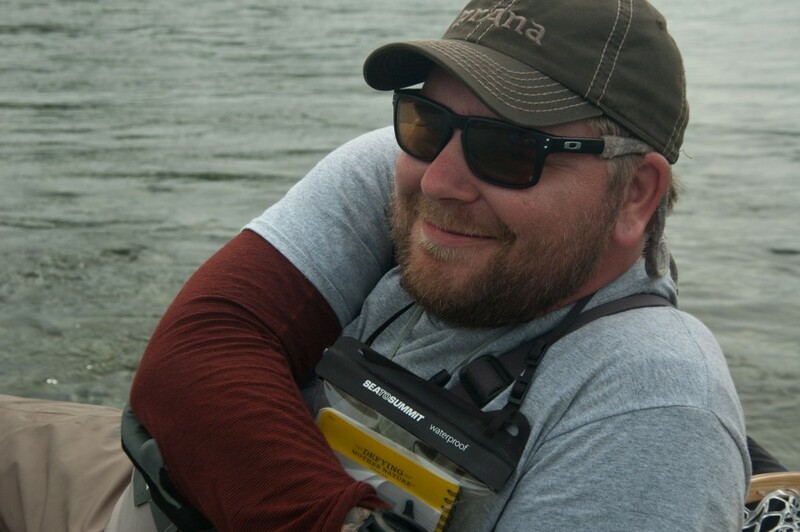 We passed across numerous shoals, and down small side channels requiring good navigation on the part of the oarsmen and when that wasn’t enough we got out and dragged the rafts. 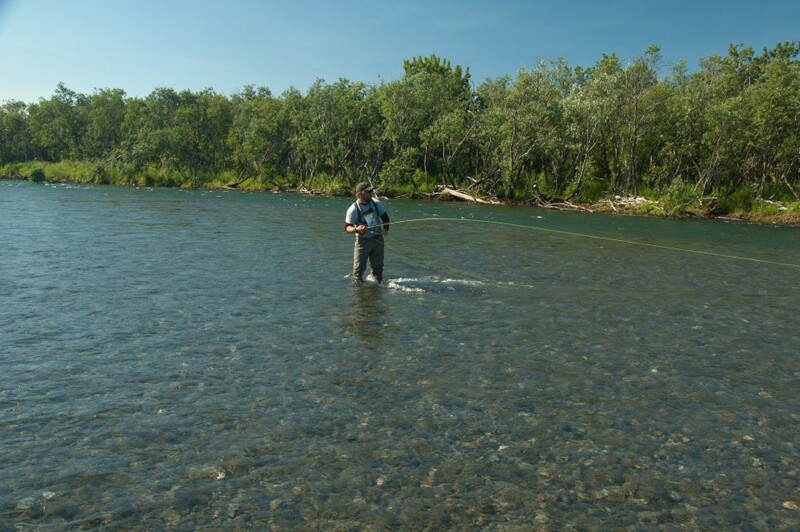 We knew by now, midsummer that we were in a prolonged drought and all the Bristol Bay rivers were low. Some were the lowest in living memory. 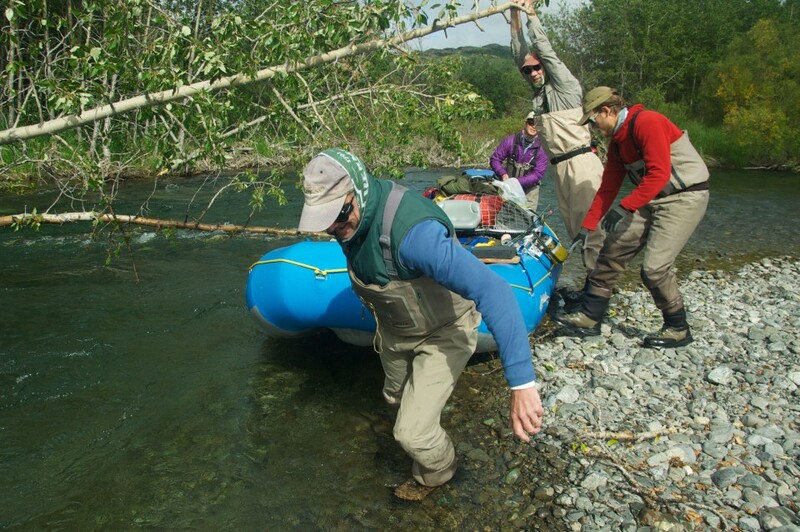 We all helped with the rafts and by days end we’d gathered enough water from tributaries to reduce the need to drag. With respect to the drought and low water, on July 31, I was moderately concerned about water levels and temperature relating to the health of the fishery and took more quantitative notes on fish numbers than I might at other times. In the upper 30 miles we saw about 1000 Sockeye, and 350 King Salmon but relatively few Chum, perhaps only 50. The numbers of Sea Run Dolly Varden were quite good. We counted in excess of 900 Char, released more than 100, and Richard provided a fine one for supper. 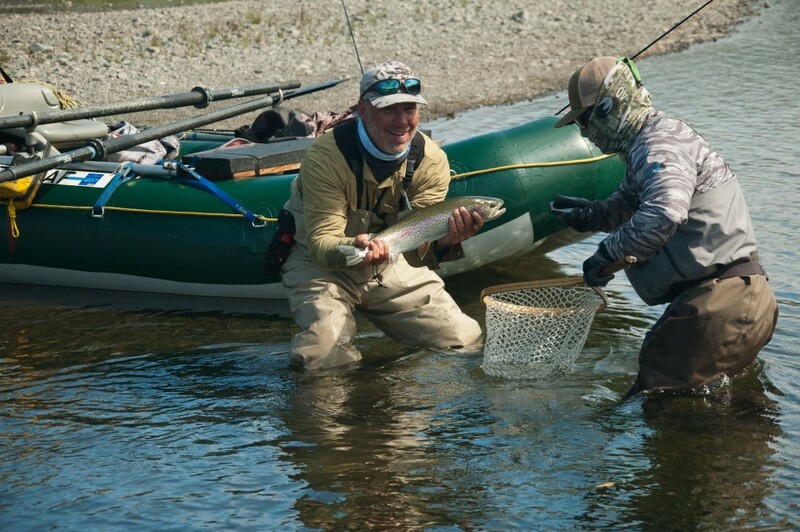 The Rainbow fishing held up nicely and enough trophy Arctic Grayling were taken to be very interesting. Nora took the “Fish of the day”, at least in the category of “Most adventuresome angling activity coupled with least predictable outcome.” She’d entered a small channel hardly wide enough for the raft to maneuver and was casting a trout bead for Char. 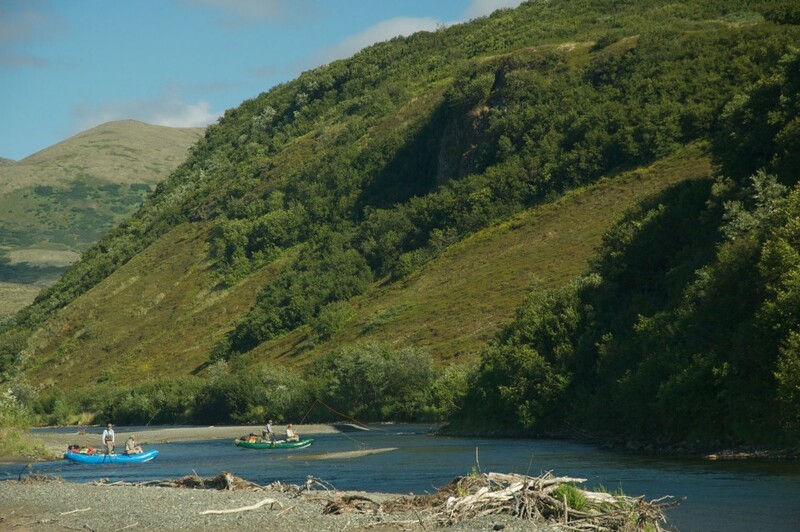 Brian, on the oars, reported that just as he had to make several crux oar stokes in a tightly overhung willow jungle that: “Nora hooked up on an acrobatic Sockeye and it was a complete rodeo. 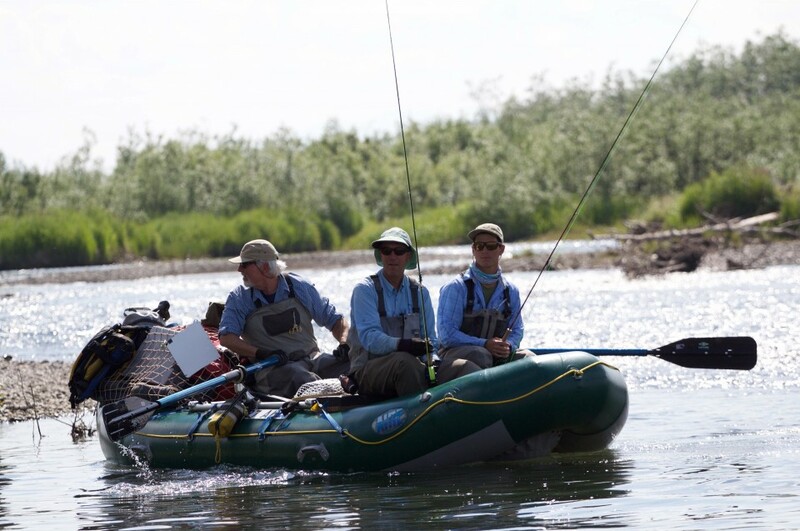 I didn’t believe there was any chance of landing the fish.” The outcome was never clear as Brian focused on safely navigating sweepers and narrow “S” curves while downstream Nora’s fished porpoised about in the log jams. There was an impossibly loud war whoop and sustained hilarity coming from that channel as the fish was netted! My concerns about low numbers of Chums was gradually relieved as the day went on and mile upon mile we saw more Chums building redds and spawning. 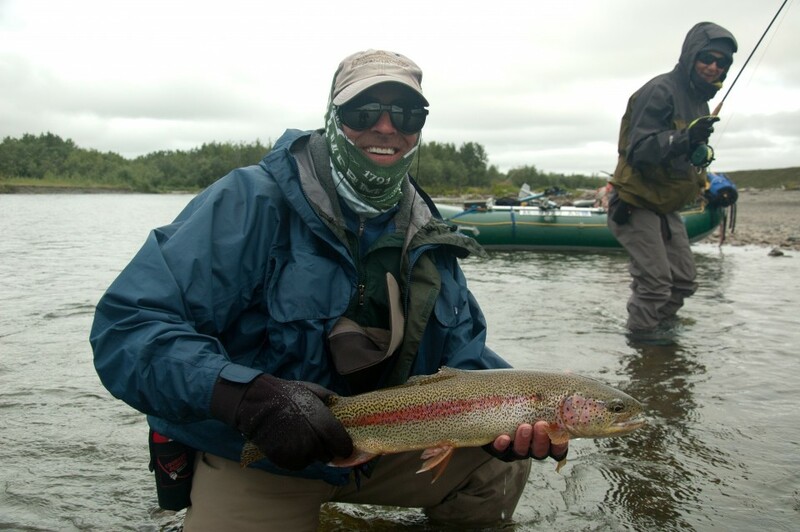 Char and Rainbows were taken in nice numbers associated with the Chum spawn. 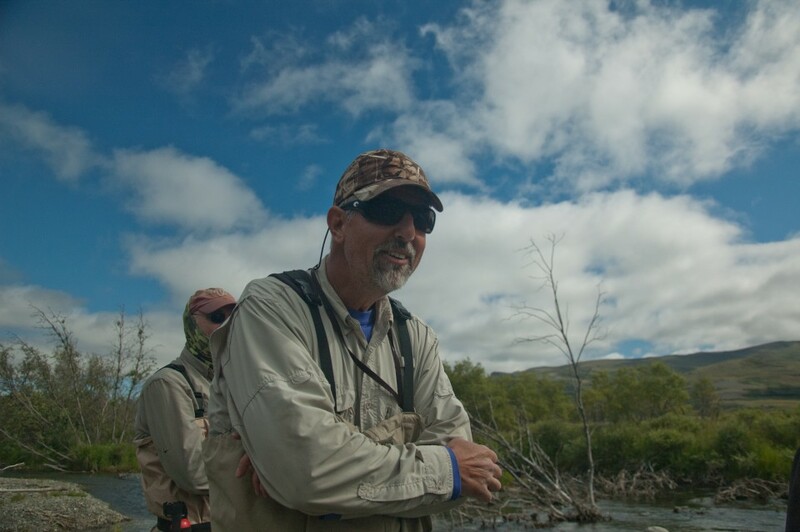 My notes say in particular that Ken “had a huge day!” That was particularly gratifying to me because Ken has come from a largemouth and small mouth bass fishing background and was on his first trip to experience both Alaska and fly-fishing. Also noted ”Pete and John’s boats pioneered a new channel system and reported spectacular fishing at what they named the “Char factory”. We passed through the weir on August 2’nd and a small dark Merlin (falcon) hunted past with great intensity. Fred and Nora fished with me as a marine layer burned off to fair skies and temperatures in the ‘70’s. 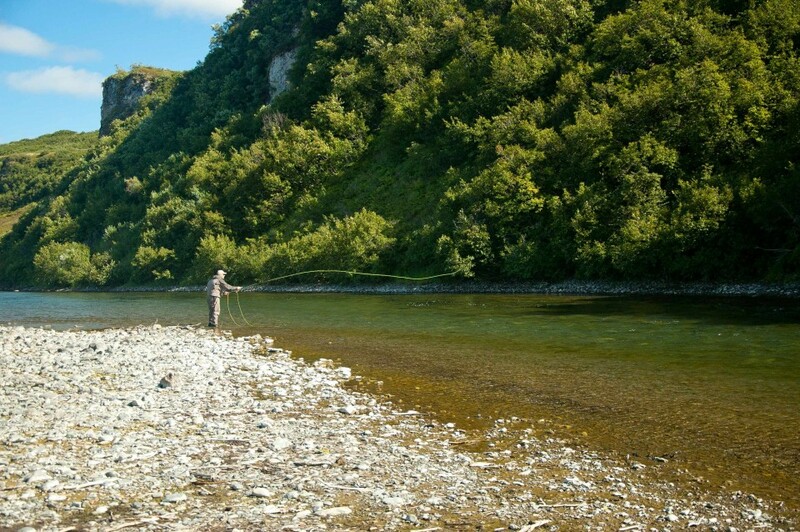 Fred, who has an extraordinary fly-fishing resume had fished dries exclusively for the past several days and taken a great many Rainbow and Grayling. 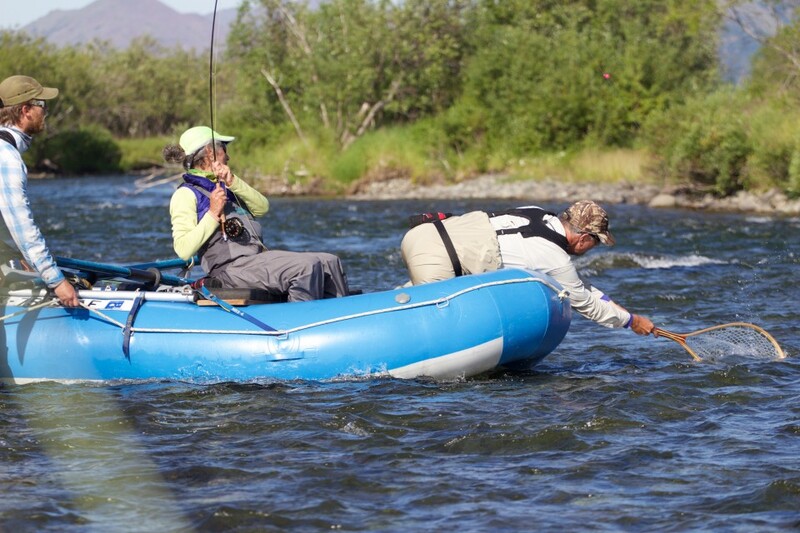 Nora who fished from the right side of the raft was instructive to watch as she worked out her line. Together we cheered as Fred ‘double hauled casting backhanded’ from the left side hour after hour. He pitched the mouse to the woody banks with a fever. 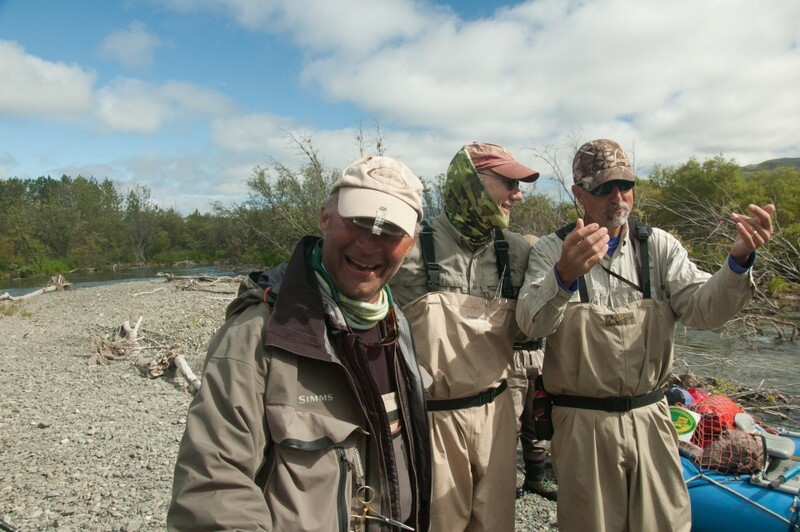 Fred reminded me by example that “mousing” can be an endurance sport, an “angling marathon” for the caster. Still the results were impressive for both anglers. We took a lunch break on a long curving gravel bar. In graphic ways these gravel bars are a record of historic flood events evidenced by tons of woody debris piled from prior floods scattered across the bar. A family of 4 mink made an appearance scampering through the flood debris and then disappearing like magicians. Nora and I followed as fast as we could which was not fast enough to keep up. In any case each gravel bar presented a different scene and it was such a treasure to view this landscape with friends! From the log of August 3, 2015: “Weather hot. Terrible No-See-ums in the morning! Afternoon winds at 10 mph blew them away, thankfully!” I fished and boated with Wayne and Larry under wonderfull conditions. Both men are accomplished Rocky Mountain anglers. 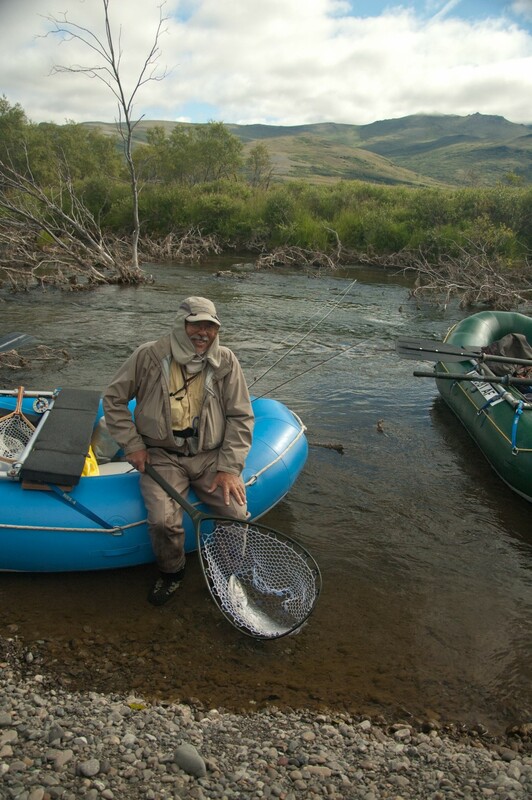 We’d last fished together on a Bristol Bay river about 5 years prior in what came to known as the “Epic Alaskan Fly Fishing Evacuation” trip where we successfully rescued ourselves and 2 other parties in what I’ll call a “sphincter tightening” flash flood. For the details of that adventure listen to the podcast on Dirtbag Diaries “What We Had” http://dirtbagdiaries.com/what-we-had/. Today we had each other and a collective sense that karma was repaying us with another side of what wild Alaska can offer- today we had a plentiful bounty of fish and friendship. the peak of their spawning and their carcasses are plentiful.” Wayne and Larry and I had a poignant day catching and releasing Rainbows and Char plus the occasional salmon but not connecting with the elusive Coho, yet! 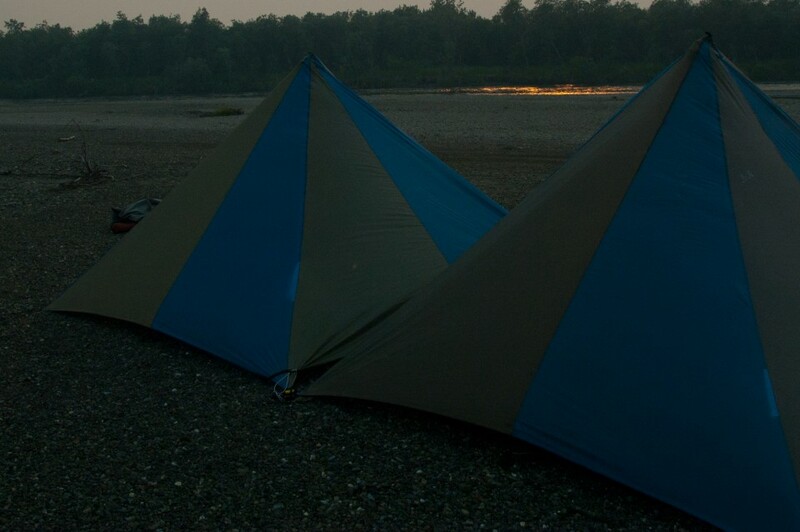 We camped that night on the most improbable gravel bar. 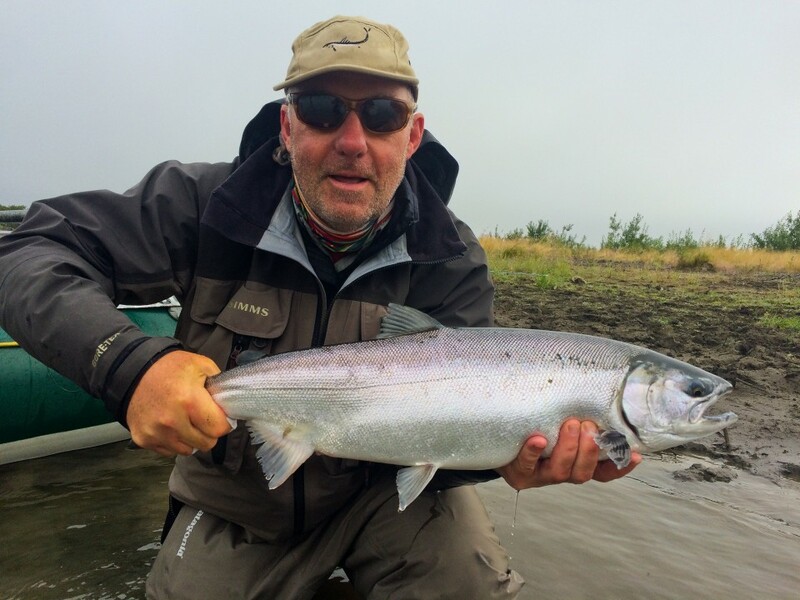 It was long, low, and narrow, comprised of fine pea gravel, with a latrine of dubious character, yet enhanced by Coho and Chums off the lower end in an eddy. A beaver lodge occupied a slough and it was all quite lovely and wild and scenic but that wasn’t the best part. The best part was a nice breeze that swept it free of insects in what was developing as the worst No-See-um year in memory! From the log of August 4, 2015: How fast the season shifts toward autumn. “The ‘tardy’ sun rose at 8:49 am to backlight hundreds of salmon fry leaping for midges in the beaver slough behind camp. 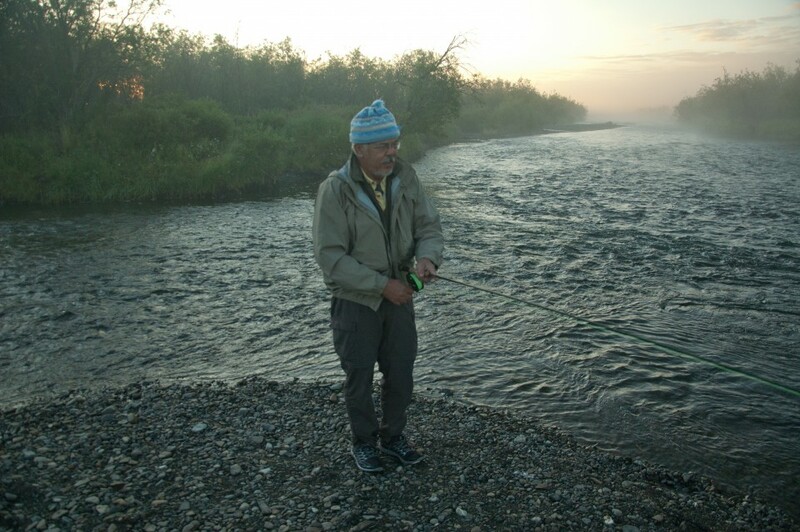 It also illuminated Richard hooked up to a Silver Salmon leaping”. How many Alaskan camps have I shared with Richard? Hundreds perhaps! The camps have been scattered from far eastern interior Alaska along the Yukon, to the Arctic Refuge, to the wild creeks of the Bristol Bay. Such joy to celebrate friendships as we travel together this week. I fished with Alex and Chip the next day, and while the Rainbow fishing was solid, today was the day we shifted tactics to dredging with articulated streamers for Coho. Chip found success in the eddy immediately below camp upon departure. We fished hard and the day was perfect and was only slightly marred by my request that Alex leap out of the boat while it proceeded at an impossibly high rate of speed past a beach I wanted to bring the boat to a halt at. We regained our composure and proceeded and both took nice Silvers and Alex’s very last fish, taken just before we made camp, was a nice 10-pound male coho that went directly to the chefs for sushi preparations! The field notes mention we’d only been seeing 1-2 Arctic Terns / day whereas in early July we’d see a dozen pairs per day. We believe that those Terns that had successfully reared young have already migrated to the coastal estuaries. I watched a Goshawk hunting near camp and Richard Voss reported hearing his first White Fronted Geese of the autumn. We noted an awkward finding: “A dead Raven found on the large gravel bar across the river from the Togiak Refuge Wilderness Sign post.” It seemed highly likely the Raven carcass, found at this location where so many local and visiting people stop, died by the hand of man. I could not bring myself to handle the Raven out of respect for that stellar bird which has mythic significance to travelers in the Alaskan wilderness and among Alaskan peoples. We who saw it felt sad & ashamed for whoever caused it’s demise. Now we are firmly in the lower river- just a few dozen miles from the salt and we saw large numbers of Chum Salmon carcasses decaying on the river bottom. Visually the salmon carcasses are grotesque, yet ecologically they are beautiful. In some cases one sees the salmon fry feeding directly upon them as they decay and that seems significant. Yet many times the carcasses are deposited in deeper pools or entangled in submerged logjams or root masses and one never learns what becomes of them. Yet at some level we knew they were providing the nitrogen and other nutrients that the river and estuarine ecosystem needs. The fishery changed and every boat began taking Coho, first as scattered singles and later the numbers of Coho which were released got silly, which is not to say that it was ever easy, rather that the anglers re-focused from trout, changed tactics and earned success with Silvers. It was extremely gratifying to me that each of the anglers this week found lots of success. From mousing for Rainbows and Grayling, to skating dries for Char, to the hours spent throwing streamers for Coho; all the anglers, without exception had a great week. In each case they found what they’d travelled to the Kanektok for. 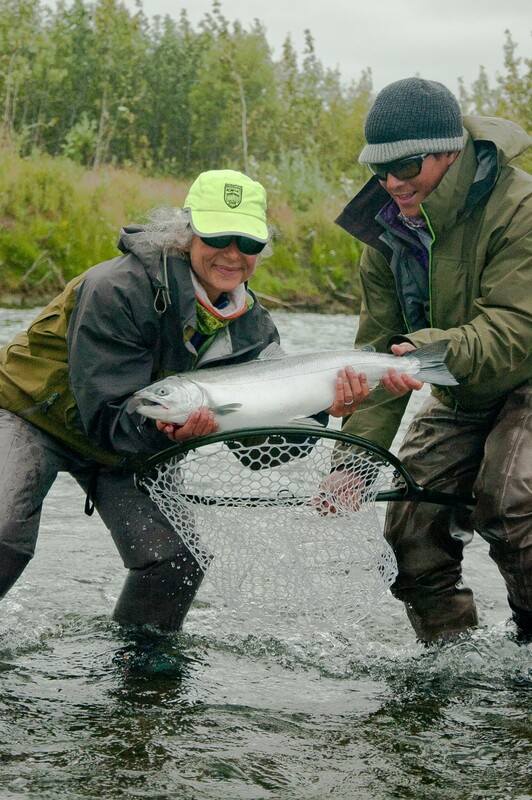 For all of us it was a week among friends celebrating the phenomenal bounty of Alaska’s Salmon, Char, and Trout. The 2018 Season Reports are now available online. Don't miss the slideshows or PDF downloads. Sign up for our occasional newsletter. Proudly powered by WordPress | Theme: wrf by Automattic.